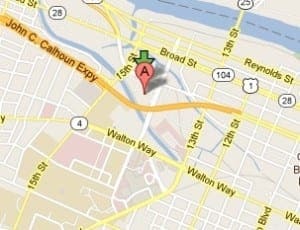 If you are coming to the Zapata Technology office from I-20, you will exit onto Washington Road (Exit 199). • Take a right onto Washington Road and proceed toward downtown. • Continue on Washington until it feeds onto the Calhoun Expressway. • Once you are on the Expressway, take the 15th Street Exit. • Make a left at the light at the end and either remain in or get into the far right lane. • You will immediately go over a little bridge (over the canal) – take a right at the traffic light immediately after you go over the bridge (will be Greene Street). 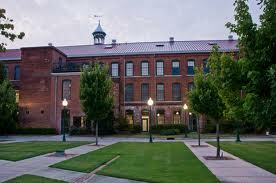 • You should immediately see the Enterprise Mill on your right (large 3-story red brick building). • Take a right at the first driveway and this leads to the back entrance. • Come through the double doors at the ramp (nearest Greene Street). We are the first suite on the left.